A particularly good selection of private gardens in Provence, created by leading local landscape designers, has been chosen for this tour. 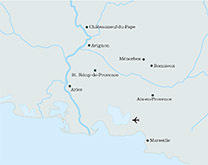 Those in the Luberon are influenced by the late Nicole de Vésian, who created her personal garden, La Louve, in Bonnieux. We visit an impressive Land Art garden near Eygalières at the foot of Les Alpilles designed by Alain David Idoux, a pupil of de Vésian. 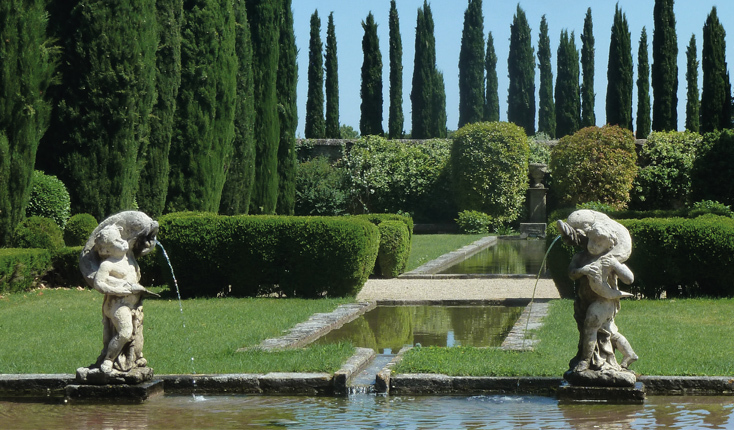 In addition we discover gardens created by Dominique Lafourcade, an influential designer from St Rémy de Provence. Cypress trees, country roads lined with majestic plane trees, olive trees and vines, all against a backdrop of craggy limestone hills or forested mountains, are just part of the superb Provence landscape. The climate is challenging: Hot summers with the fierce Mistral blowing down the Rhône valley, a lack of water, and even cold winters. Yet the gardens are stunning. Our base for the tour is a most gracious, beautifully restored hotel just behind the Palais des Papes in Avignon. 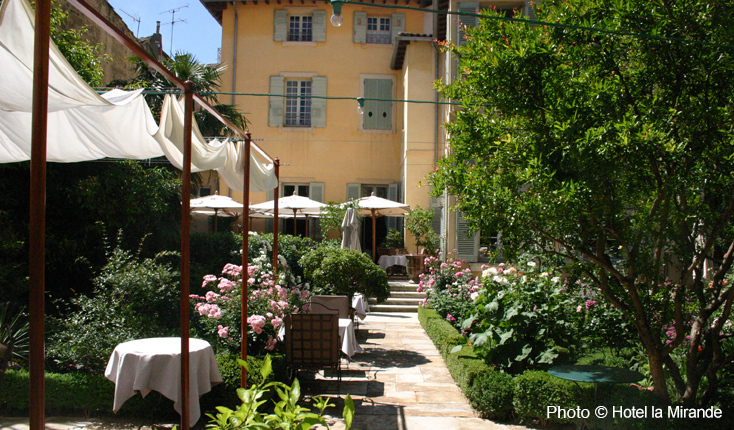 Hotel La Mirande, originally built in the eighteenth century, is family owned and managed. It is renowned for its gastronomic restaurant where seasonal local dishes are produced by the head chef and his team. 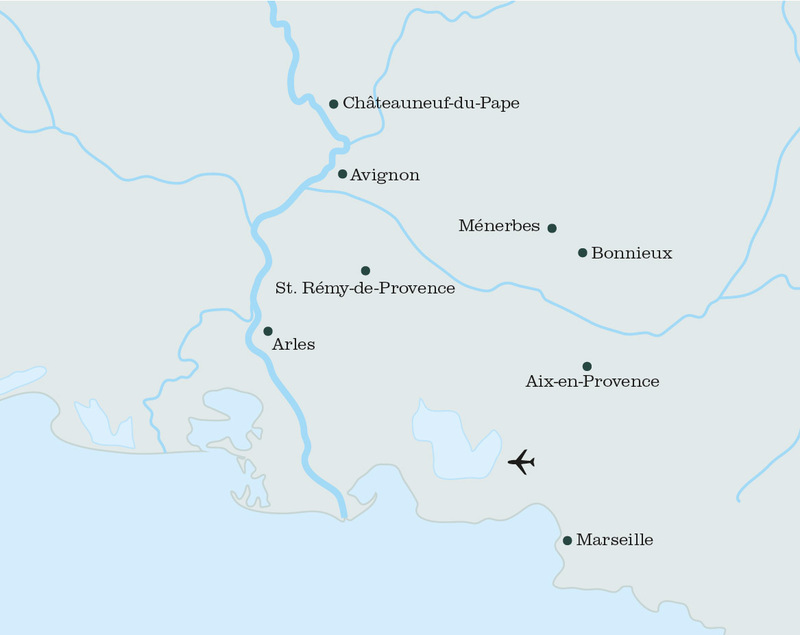 Travel by train from London St Pancras, via Lille to Avignon TGV station where you will be met and transferred to Hotel La Mirande. Evening aperitif is served in the attractive garden with a short talk on the programme, before enjoying a welcome dinner together. We head up into the majestic Alpilles to visit Domaine de l’Abbaye de Pierredon. Off the beaten track amidst the garrigue, olive trees and vines, the ancient abbey and mas are surrounded by an enchanting garden restored by Dominique Lafourcade in her inimitable style. Delicious lunch under the plane trees in Eygalières. Afternoon visit to a garden designed by Alain David Idoux and tree sculpture specialist Marc Nucera in the foothills of the Alpilles. Their creation of a triangular lavender wedge, almond spiral and sculpted holm oaks are inspired by the Land Art movement. Free evening to explore Avignon. 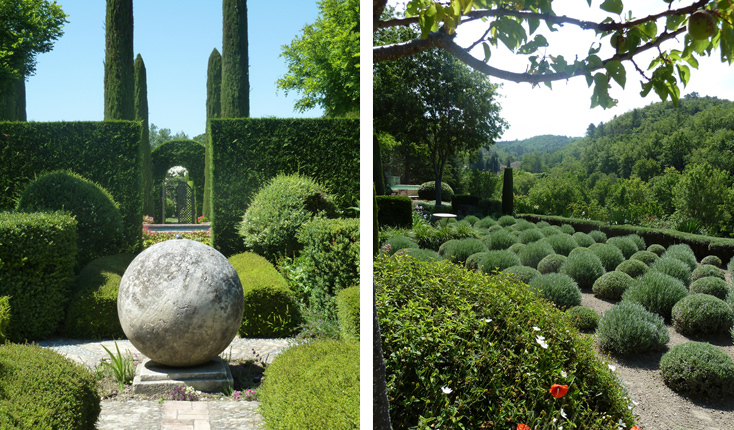 We spend a full day in the Luberon visiting gardens influenced by Nicole de Vésian. We start in the hill village of Ménerbes with a visit to a fabulous private garden with terraces descending to an orchard, olive grove and potager designed by Michel Biehn. On to another inspirational terraced garden designed by de Vésian on the hillside of Ménerbes. Our afternoon visit is to Bonnieux and to the fabulous garden at La Louve, formerly de Vésian’s home. Return to Avignon. Aperitif in the hotel’s wine cellar inspecting their fascinating range of wines followed by dinner in the company of the chef, tasting his specialities. The atmosphere in the original kitchen with its vaulted ceiling is convivial and memorable. 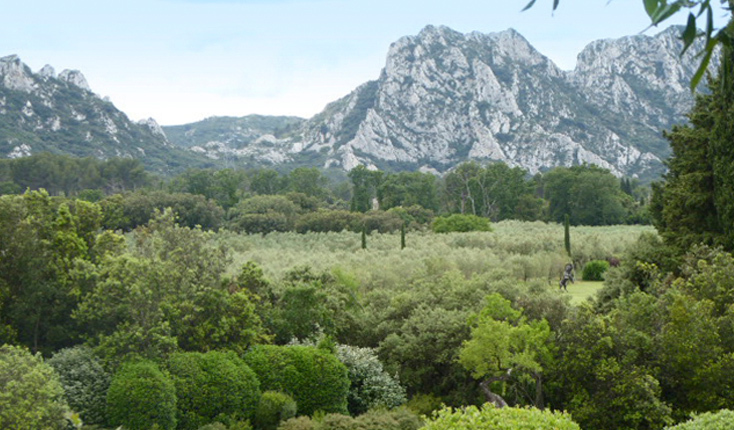 We travel to the western end of Les Alpilles to the superb garden of a former American ambassador. The designers, Rosemary Verey and Peter Coates, laid out the original garden and Tim Rees has added a woodland stream and Roman garden. Free lunchtime in St Rémy de Provence. Just above St Rémy is a private garden designed by Dominique Lafourcade at the foot of the Alpilles, where a long drive lined with cypress and passing through olive groves approaches the villa shaded by an enormous plane tree. The land is mostly planted with typical garrigue – cistus, lavender, santolina and thyme – through which a path leads to an enchanting potager garden. Dominique Lafourcade has created for herself a stunning new garden around an Italianate villa above St Rémy. We discover her beautifully planted garden before enjoying a buffet lunch in the conservatory filled with exotic plants and a huge banana plant. Return to Avignon for some free time before our final evening in the hotel restaurant. Crossing the Rhône we visit the Abbaye de St André, where the interiors have been imaginatively restored following the devastation of the French Revolution. 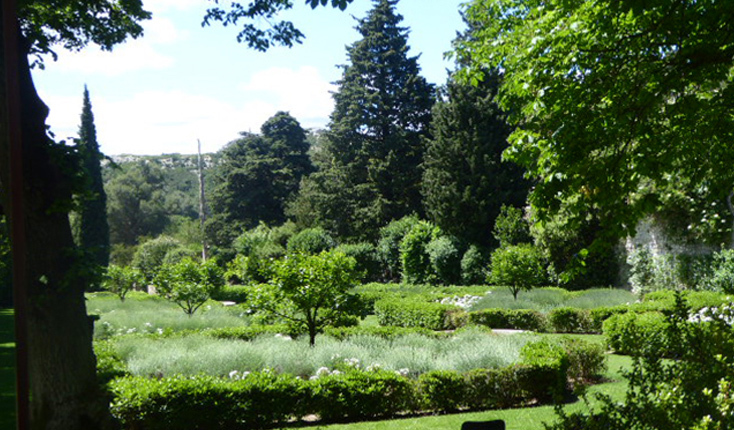 An Italianate garden around the Abbaye leads to terraces of underplanted olives. We enjoy an aperitif and refreshments before leaving for the TGV station to return to London St Pancras via Lille. Premier class Eurostar/TGV train. Transport in modern, comfortable minibus. Deluxe accommodation, delicious meals as indicated. All garden visits and guides. Alcoholic and soft drinks at lunchtime, items of a personal nature, tips. Comprehensive travel insurance with full cover to be taken out on payment of the deposit. The climate in September is balmy and warm. Layers are recommended from lightweight summer to a jacket in case of the Mistral. Good, comfortable shoes for the garden visits. Smart casual for the evening. The Eurostar train from London St Pancras to Avignon TGV station and return is available with just one change at Lille. Terraced gardens with steps and undulating terrain.